This year marks the 50th anniversary of the Lamborghini’s first ever production four-seater, the Espada, a striking low-slung design penned by Marcello Gandini that was regarded ahead of its time, was produced in significant numbers for that era, and denoted a new direction for the Italian sportscar maker. 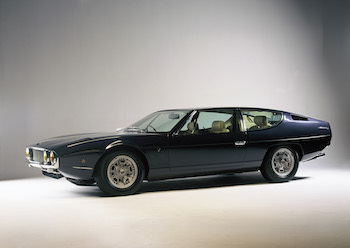 According to Lamborghini 176 examples of the first series were produced, 578 units of the second and 472 units of the third series Espada were built before production eventually ceased in 1978. The story of a four-seater from the Sant’Agata brand actually starts with the ground-breaking Marzal concept which was first shown to the public at the Geneva Motor Show in 1967, three years after the company started producing cars. It was also designed by Gandini, who was at the time working at Bertone, and Lamborghini’s first serious attempt at a proper four-seater. The Espada's design was lifted from a Bertone show car, the Pirana, which debuted in 1967 at the London Motor Show in Earl’s Court. That project was based on the Jaguar E-type and featured a steel monocoque and opulent interior. Curiously the Pirana was commissioned from Bertone by a British newspaper, “The Daily Telegraph”, as an attention grabber. The concept was very well received by the media and was also shown at the New York Auto Show. 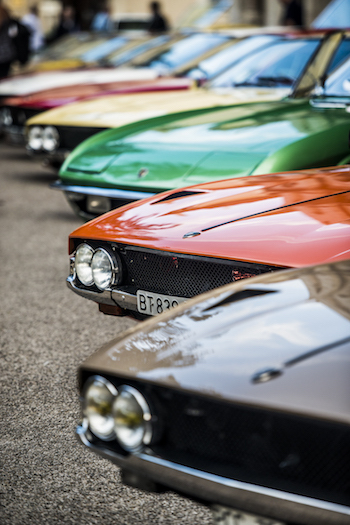 Last month, to celebrate the milestone of the 50th anniversary of the Espada, Lamborghini organised an official tour around Italy for twenty of these cars. Starting in Perugia, the tour route covered almost 800 km, crossing through Umbria, Tuscany and Emilia-Romagna, cruising over picturesque hill routes and through the historic centers of cities including Orvieto and Assisi. 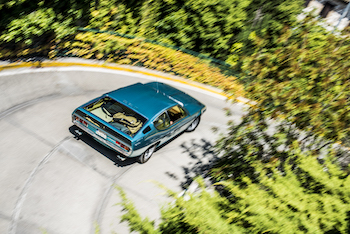 Of all the brand’s historic cars, the Espada also boasts one of the highest numbers of units produced: 1,226 units built during its ten-year production run. The Espada’s lines are the fruits of a design by Marcello Gandini for Carrozzeria Bertone. It sits very low to the ground, standing at little less than 1.20 meters high, but is nevertheless has an extremely spacious interior. The Marzal used a stretched version of the Miura’s chassis, the iconic mid-rear engine supercar that had gone into production to great acclaim the previous year, fitted with an in-line 6-cylinder, 2-litre engine mounted transversely at the rear. This was derived from the V12 unit used by the Miura, in effect being chopped in half longitudinally. The external design was dominated by the almost completely glass gull-wing doors and transparent roof panel, and a noticeable lack of height, which was only 1100 mm. Company founder Ferruccio Lamborghini reportedly didn’t like the design and so the project remained as a one-off. However, the Marzal was a fully working prototype and it enjoyed a high-profile moment in the sun in May 1967 just a couple of months after its Geneva debut. Shortly before the start of the Monaco Grand Prix, Prince Rainier III completed a parade lap of honour on the Formula 1 track in the prototype, with its glazed gullwing doors offering spectators an almost unimpeded view of the interior and the extravagant silver leather upholstery. Princess Grace sat in the passenger seat, next to Prince Rainier. Photos of the couple in the Marzal traveled all around the world, turning this unique prototype into a legend. Since then, the Marzal’s engines have mostly remained silent and hidden away from curious eyes apart from sporadic concours and show appearances – until this May as during the weekend of the 11th edition of the Grand Prix de Monaco Historique with the support of the Lamborghini factory, the Marzal celebrating its history by completing several laps on the same roads as in 1967. Meanwhile, the Marzal had given a useful pointer towards a future where four seaters would be included in the range and Lamborghini’s next attempt in this direction, the Espada would bear more fruit. The Espada project reverted back to a more conventional front-engine, rear-wheel-drive layout as was used in the new Islero. That sportscar donated almost all its drivetrain and suspension to the Espada, while it was underpinned once again a highly modified Miura platform. The design was lifted from a Bertone show car, the Pirana, which debuted in 1967 at the London Motor Show in Earl’s Court. That project was based on the Jaguar E-type and featured a steel monocoque and opulent interior. 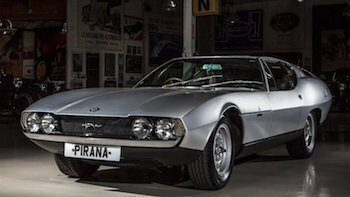 Curiously, the Pirana project was actually commissioned from Bertone by a British newspaper, “The Daily Telegraph”, as an attention grabbing novelty. The concept was very well received by the media at Earl's Court and was also shown stateside during the New York Auto Show. With Lamborghini giving the ambitious four-seater project the green light, the production ready Espada was unveiled at the Geneva Motor Show in 1968, fifty years ago and it hogged the headlines as it became the fastest four-seater production car in the world, with a claimed top speed of 245 km/h. A true grand tourer rather than a sports car, the Espada was nevertheless widely complimented for its neutral handling and exceptional road holding, in dry conditions at the very least. Very low wind noise enabled comfortable high-speed cruising, but the common Lamborghini criticisms of that era of heavy steering, poor driving position and chaotic cockpit design were quickly applied to the Espada, at least on the early production cars. The big 4-litre (3,929cc) V12 engine mounted at the front was more suited to higher engine speeds, where throttle response and power were exceptional, rather than the lower regimes. It featured six twin-barrel Weber carburetors. The first series ceased production in January 1970 just as the second Espada series started rolling out of the factory. This facelifted version used the more powerful engine from the Islero S together with ventilated disc brakes, whilst power steering became an option. A period road test of this version recorded 28.2 seconds for the standing km and 7.8 seconds for the 0-60mph dash. From about 1972 onwards the Espada was also optionally offered with a three-speed automatic transmission, a Chrysler sourced unit, that was mainly aimed at the US market. It was the first Lamborghini model to be equipped with automatic transmission. That year also saw the third series enter production, with a further improved engine, power-assisted steering as standard, upgraded air-conditioning, a modified grille and lights, a revamped and improved interior and numerous other detail changes. 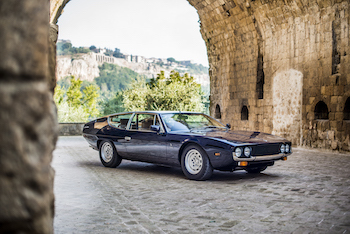 Last month, to celebrate the milestone of the 50th anniversary of the Espada (as well as the Islero) Lamborghini organised an official tour around Italy for twenty of these cars. Starting in Perugia, the tour route covered almost 800 km, crossing through Umbria, Tuscany and Emilia-Romagna, cruising over picturesque hill routes and through the historic centers of cities including Orvieto and Assisi. Several Espadas that took part stood out for their particular stories and received a special mention at the end of the tour by Stefano Domenicali, Chairman and CEO of Lamborghini. An award for the Espada owned for the longest period of time by a single owner went to a Series 3 example from 1973, chassis no. 9300, which was purchased as a used car in January 1977 by two English owners. For many years it was the only family car, used on a daily basis to go to work and take the children to school. Considered to be part of the family, it was recently restored and registered for the tour on the occasion of the owners’ golden wedding anniversary. The award for the Espada driven from furthest away went to the very rare Series 2 model, chassis no. 8386, which was one of only twenty that were produced with a “VIP” fit-out. The Norwegian crew, who made the round trip from Oslo in their Espada, traveled a total of 6,000 km. Also participating in the tour was an Espada drawn from the official Lamborghini Museum, a Series 3 example from 1976, chassis no. 9090, finished in the colour Blu Notte.